Thiessenhusen Plumbing has been a local family owned business since 1932. Dale represents four generations of plumbers priding themselves on personal customer service, quality workmanship, and fair honest pricing. Dale specializes in residential service and is happy to share his knowledge and experience with his customers, providing them with not only replacement but also repair options, when your plumbing troubles can be addressed multiple ways. 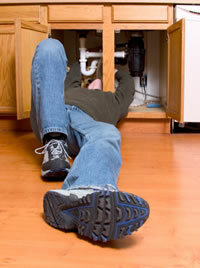 Thiessenhusen Plumbing strives to help our customers make informed decisions to attain long term trouble free repairs. Because happy customers provide our best source of advertising, we give you our best 100% of the time. 1. The difference in a five minute and ten minute shower is about 12.5 gallons of water. Shorten your time and save water!Helpful Hints To Reduce Your Water Bill! 2. A dishwasher uses three to five times more water than doing dishes by hand. More labor, less water. You choose! 3. Don’t run tap water while waiting for it to get cool. Keep a jug of water in the refrigerator. You will have a cooler drink and save!